If you are present at a live gig and if later a recording of that gig is released it is often the case that the listener wonders what has happened to the excitement of the live performance, unfortunately that the thrill of the night does not carry over to the recorded performance or perhaps it was the atmosphere at the event that made it seem better than it actually was. 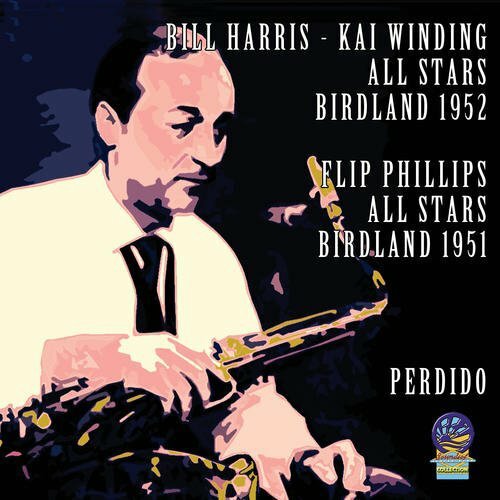 The first three tracks by the Flip Phillips All Stars are a case in point, Bill Harris plays well enough but on two of the numbers, “Perdido” and “Lover Come Back To Me” Flip Phillips is very much in his Jazz at the Philharmonic mode and plays to the gallery. “Lazy River” is a little better where the tempo is slower and Flip shows he is more rhapsodic player in the right surroundings. Lou Levy is stuck with a piano that sounds like it came out of a skip and needs to be thrown straight back which is a pity as he magnificent pianist. The final four tracks by the Bill Harris / Kai Winding All Stars are a big improvement and once again Bill Harris performs well but Kai Winding pales a little by comparison. If it wasn’t for the presence of Bill Harris I would stay clear of this release but he is such a good player it is always good to hear him.